A dedicated page of pictures donated by WOR-FM personality Tommy Edwards! Marty Brooks is a big fan of the progressive rock era of WOR-FM. 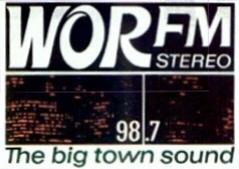 Some original promotional materials from WOR-FM's beginning. Like many radio pros, Norman had a favorite radio station. 99X! Al Brady (Law) was a DJ at WOR-FM in 1969 and 1970. He answers some questions about the Drake format! Thanks to Peter Kanze we have some interesting images from 'OR-FM! Thanks to Irv Goldstein we have some terrific WOR-FM surveys! Included are a couple of "in house" versions! New York Radio historian Vince Santarelli has some additional WOR-FM/WXLO/99X contributions! Anyone who has additional information is welcome to contact me. Airchecks are welcome as well as additional pictures and history. WORFM.com is part of the Rewound Radio non-profit 501(c)(3) educational organization dedicated to persevering the art of Top 40 Radio.